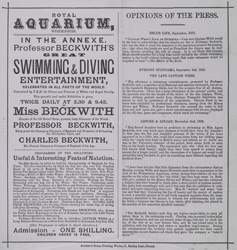 The Royal Aquarium was built in 1876 for the then-staggering amount of £200,000. It was a large exhibition hall and housed an art gallery, restaurants and a library. It was only in use for 26 years, being demolished in 1902 and replaced by Central Hall, the chief Methodist church in England. Many of the aquarium's interior facets and fixtures were used to build and embellish Imperial Theatre in Canning Town. Unfortunately the Imperial was destroyed by fire in 1931, so nothing remains of the beautiful aquarium.